Trophies were presented on Saturday evening at the Cercle Nautique Calédonien yacht club and many crew from the coinciding races out of Sydney and Auckland are flying back to their home ports on Sunday. They leave behind a small but enthusiastic group to welcome in the last crew, who have not only copped the only light winds of the record-breaking race but now heavy rain is falling across the South Pacific island’s capital. Sebastian Bohm’s Rogers 46 Smuggler sailing for the organising club, the Cruising Yacht Club of Australia, collected the IRC overall, IRC division 1, ORCi and PHS top trophies. Steve Capell’s Swan 65 Eve took out the IRC division 2 top prize, admitting “we had unfairly comfortable and easy time; this was exactly the race our boat was built for. It’s 40-tonnes of cleaning the ocean; it doesn’t bounce or slap. We put four sails up just outside the harbour and took them down at Noumea and did 10 knots almost the whole way on the same gybe. Cartouche and Kayimai were pushing us, which kept us engaged. We probably should thank them for the win,” Capell added. IRC division 3 honours went to Phil Bennett’s custom John King design, King Billy, and the rumour is that this reinstatement to the CYCA’s racing calendar, following a 25-year hiatus, was the boat’s ocean-going swansong. 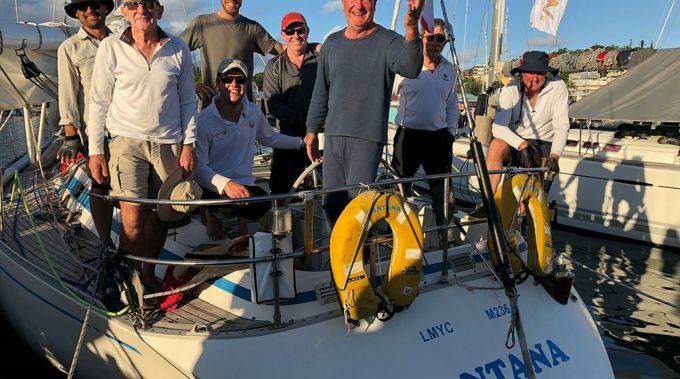 Ariki Tai wrapped-up the Cruising division and skipper Denis Doyle was acknowledged by the race committee for stepping in and relaying the fleet’s positions back to shore. A few owners are leaving their boats in New Caledonia to cruise the local waters before heading west to the Whitsundays for the Queensland winter regattas. For others there are five days ahead to relax and re-provision before the New Caledonia Groupama Race start on Saturday June 17. Five of the PONANT Sydney Noumea entries - Patrice, Dare Devil, Komatsu Azzurro, Sticky and Wings – will bravely line up for part two of their Coral Sea adventure when they join some of the Auckland Noumea fleet and the local race fleet for the sixth edition of the Groupama Race around the French island of New Caledonia. The CYCA will now take feedback on the reintroduction of the PONANT Sydney Noumea race and decide whether to make it a permanent feature of its racing calendar, and the regularity.